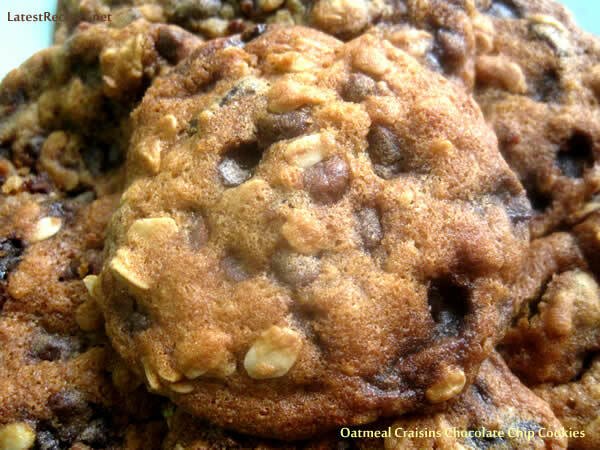 This recipe is close to my heart as it’s the very first oatmeal cookie recipe that I’ve tried. I under-baked it the first time I made but still my husband and I gobbled it up (the kids were not born yet at that time). It’s originally called “Best-Ever Chocolate Chip Cookies”; I tweaked it a little by adding some craisins, replaced the cinnamon with coffee powder and added more chocolate chips and halved the recipe (don’t I always) to make just enough to eat in a day although you may double the recipe, bake some then just freeze the rest of the dough for later use. scoop dough onto baking sheet and bake! yummy cookies –so good with milk or coffee! In a bowl, mix together oats, flour, baking soda and coffee powder. Set aside. In the bowl of your electric mixer, combine butter and sugars, beat at medium speed until light and fluffy; beat in egg and vanilla extract. At low speed, beat in flour mixture until blended. Fold in craisins and chocolate chips. Cover with plastic wrap and chill for an hour. Preheat oven to 350F degrees. Using a small ice cream scoop, spoon dough onto non-stick baking sheet and bake until blightly browned around the edges, about 10-12 minutes. Cool slightly before transferring cookies to wire rack to cool completely. 2 Responses to "Oatmeal Craisins Chocolate Chip Cookies"
These look very delicious. I love all the ingredients. A few pieces with a glass of milk will be perfect for me.